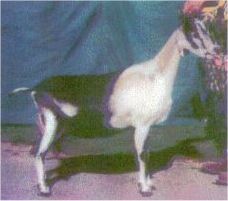 GCH - 2006 District IV Saanen Specialty - Marshfield, WI. 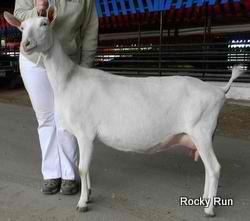 Pollen was part of our 1st place junior get of sire for Rocky-Run Rogue's Spirit as a kid at the Wisconsin State Fair. 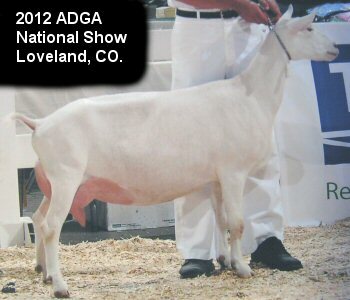 She was 17th four year old at the 2012 ADGA National Show. 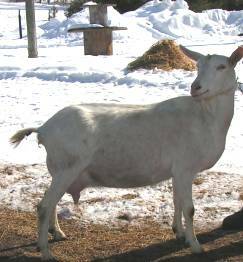 Phlox is listed here for reference as she has contributed greatly to the genetics present in our current purebred herd. 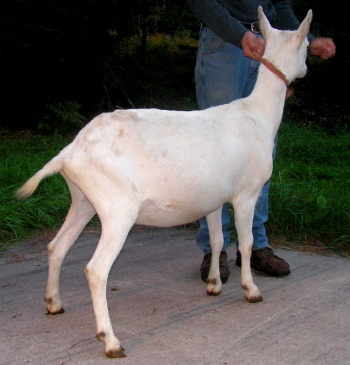 She was a very slow maturing doe who blossomed as an older doe. This trait is typical of her descendents as well. Good things come with age. It is sometimes fun to have a show stopping younger doe that peters out later on. 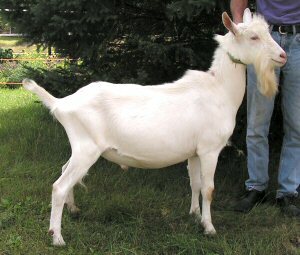 But the mark of a truly valuable dairy goat is one who holds up into maturity and continues to blossom. 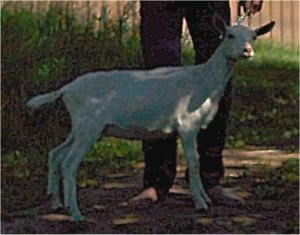 Her granddaughter Icy-Hot is one such doe, who only started to come out of the woodwork at around four years of age. Phlox will always be remembered here on the farm. 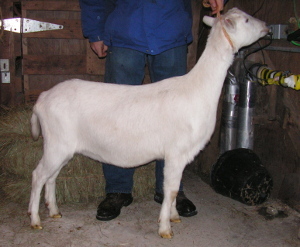 Congratulations and a sincere thank you to Linda Hockerman for purchasing Sammy at the 2016 Wisconsin Dairy Goat Association fall conference Select Sale! See www.wdga.org for more information. Morze shares a lot in common with our other Guardian daughters, including her level topline, strong feet and legs, and well attached mammary system. 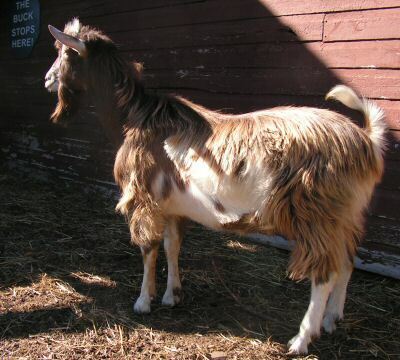 While HoneyBee is a very long bodied and tall animal, Morze has a more compact and smoother blended style. She has a wide rump that is flat and level. Her overall look is reminiscent of granddam, PoppySeed! She is a slow maturing doe who has not been shown heavily as a young doe, but now that she has matured quite nicely, watch for her in the future! 1st place 5 year old - 2015 Wisconsin State Fair. 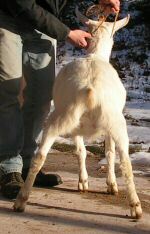 Pocket looks much like her dam Icy Hot did as a young doe with the same udder. She has Icy's attitude too. 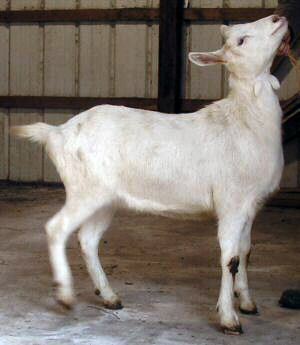 As a three year old, Icy Hot also scored LA 89 and is now 92 at six years of age! We are hopeful that Pocket will do the same. 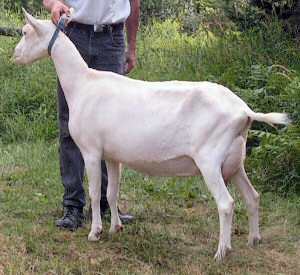 Mersault's dam, Moana, milked on DHI 3-00 266 4393 3.7% 161 3.4% 151. 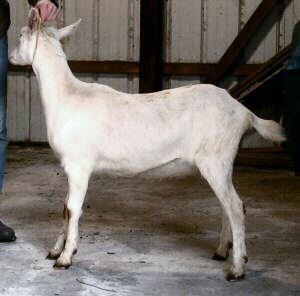 Moana's sire is full brother to GCH Lake-Country Satinet 91(EEEE), the dam of Stradivarius below. 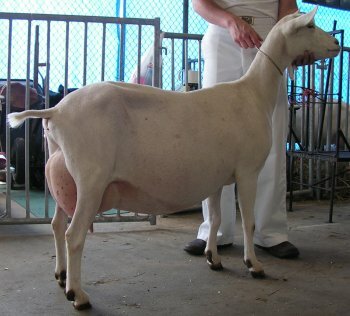 Two of his milking daughters made Top Ten on DHI with one being the Saanen Breed Leader for butterfat and protein. 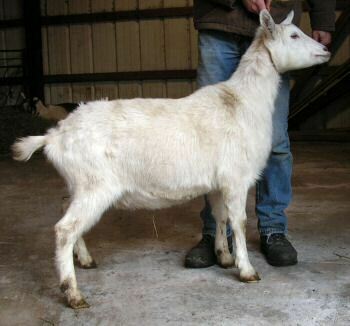 These two does were also part of Mersault's 1st Get of Sire at the '07 WI State Fair. 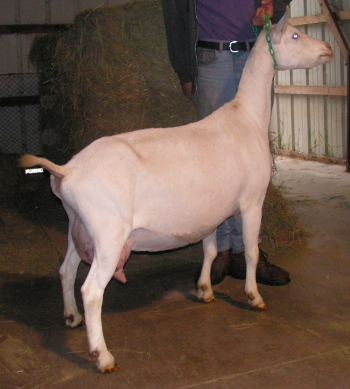 Yearling daughter was 9th pl. at the 2012 ADGA National Show. 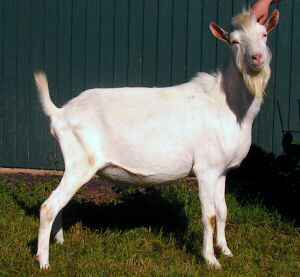 Guardian brings back to life some older purebred Saanen genetics through his A.I. sire Job Security. 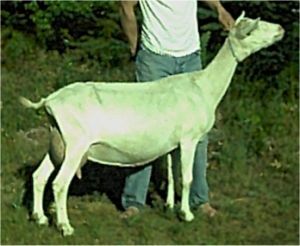 Job Security is linebred on GCH Capric Josie who had the kind of style that we admire in a Saanen and she had a phenominal mammary. Guardian's dam side compliments the Lake-Country genetics in our does. Special thanks to Pat Hendrickson for this A.I. breeding that gave us Guardian. 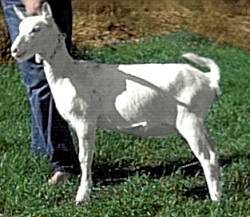 One of our all-time favorite does in our herd when we were breeding American stock was Maple-Oak Sault Aniel whose dam, Lake-Country Showbiz Amber, was a daughter of GCH +*B Lake-Country Composit Showbiz. 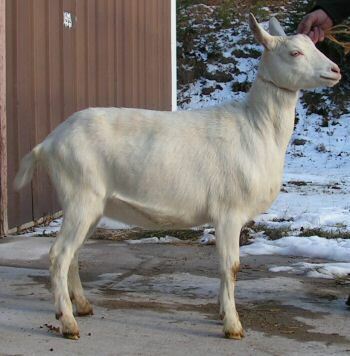 We always wanted to be able to introduce Aniel's style somehow into our purebred stock. 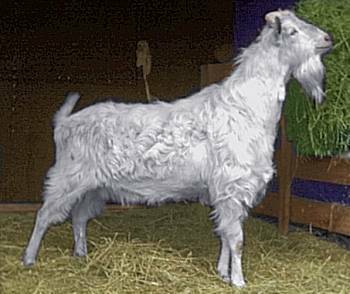 Ghost does just that for us as his Grandsire, GCH ++*B Lake-Country Composit Scenerio was a full brother to Showbiz. His daughters are very reminscent of Amber and Aniel's line, yet with even nicer mammary systems. 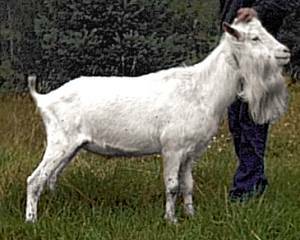 Phlox is a maternal sister to GCH Singing-Spruce Paragon, FS90(EVEE), and paternal sister to GCH Singing-Spruce Vortex Ptarmigan FS90(EEEV). 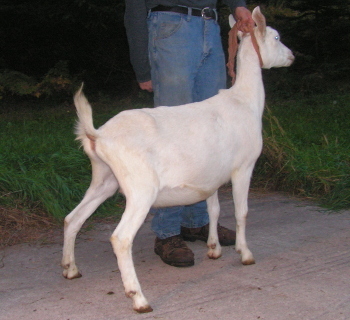 She was a VERY slow maturing doe who has blossomed as an older doe. 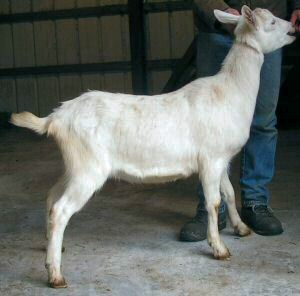 Her dam's half brother was sire of the 1997 National Champion. GCH and 1st pl. 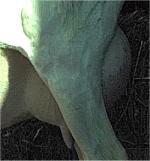 udder Ladysmith, WI. 1st place 4 yr old at Mineral Point, WI. 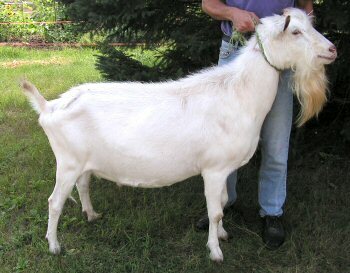 Amber is a very refined and flat boned doe who continues to improve as she gets older. Amber started to show her true value once she was a five year old. 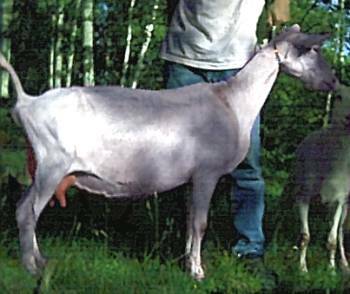 We have retained most of her doe offspring over the years, and they have always been some of our top performers. 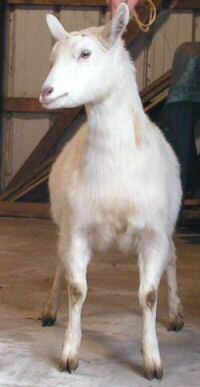 Fab is a very stylish, dairy type doe. 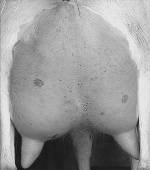 She had a nice udder with a large area of rear udder attachment and a strong medial, but contracted mastitis as a five year old. She has recovered and continues to be a good brood doe for us, though her milkability has taken pretty good hit. 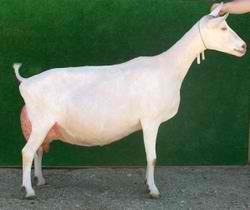 Fab was part of our 1st place dairy herd as a 2 year old at the 2000 Wisconsin State Fair. #1 for type on 95 top 15% young sires list. 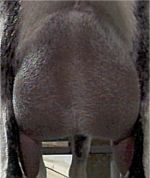 Aurelia is a wide and deep bodied doe. 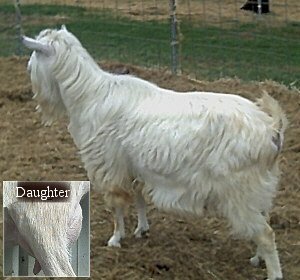 She is maturing similar to the way her dam, Amber, did and very much resembles her. 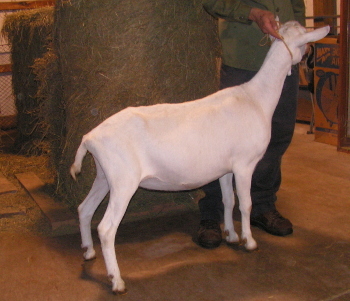 Whereas her sister, Aniel, more resembles her sire. AngelCake is following in her mom's footsteps being a second generation All-American. 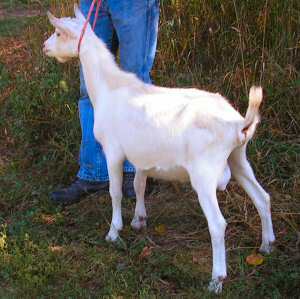 She is a beautiful doe with has nice feet, topline, excellent mammary, and a pretty face to boot. 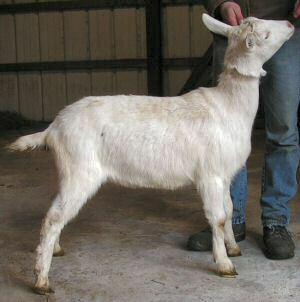 We have sold her, she is listed hear as a reference as we have retained one of her bucklings for breeding this year. Cleo earned her dry leg as a senior yrlng. 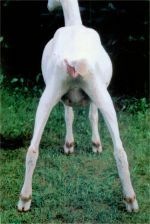 When she freshened with a gorgeous udder as a two year old, she earned Best Udder of Breed at her first weekend out in 2003. 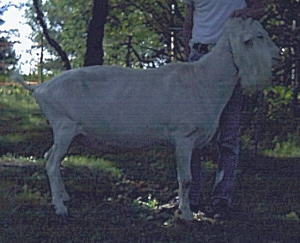 In 2004 we took her to a two ring show in Janesville where was one time RGCH and one time GCH, BOB, and BUOB. Cleo is bred to Mersault. 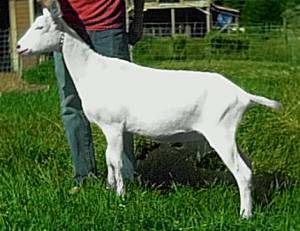 We are exited about Stella's pedigree as she goes back to Nodaway Aries and she has been crossing well with our Alpine bucks. see pedigree on buck page. 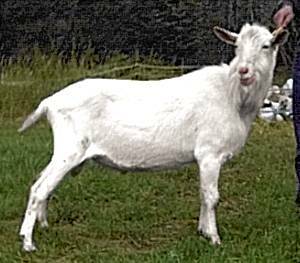 Tiara is the daughter of our beloved Princess (Kickadee-Hill Clearly Royal) who sadly passed away after giving birth to her. 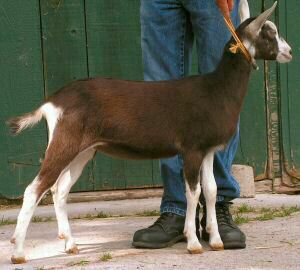 We were so happy with Princess, who milked exceptionally well and had several successes in the show ring. We miss her tremendously and must now put our hopes on her daughter, Tiara. 3x Res. 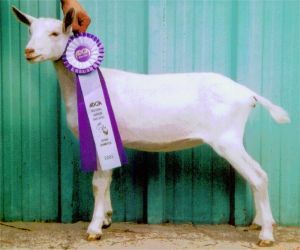 Junior CH at the 2002 4-ring Buck Extravaganza in Bloomington, Ill.
see pedigree on doe page. 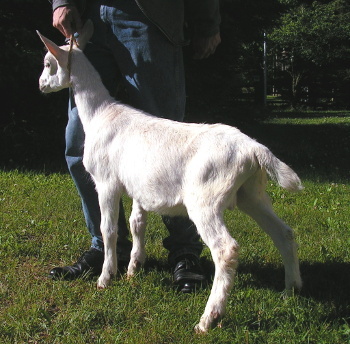 Pierre is a spitting image of sire, Lake-Country Satin Saint, who sadly we lost two years ago. He is throwing all of the same general characteristics. 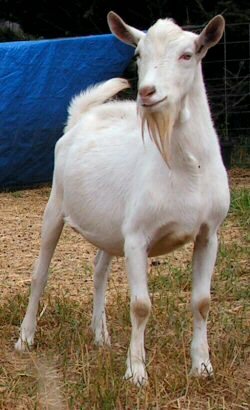 He is a powerful young buck. Our little Viella is just that, tiny. Her daughter Vanilla is twice her size. 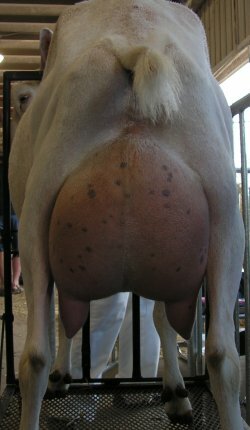 She is a heavy milker with gorgeous udder. 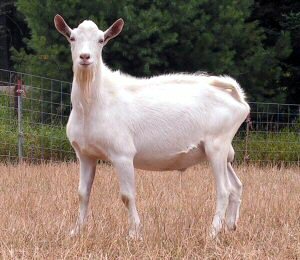 She just needs to be bred to a buck who will throw size. 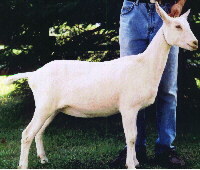 2nd pl Junior Get of Sire - 2001 Wisconsin State Fair. 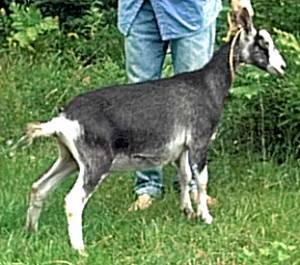 1x RGCH and 2x 1st place at the 2001 4-ring Buck Extravaganza in Bloomington-Normal, Ill.
Javi is a very impressive looking buck. He has a very wide chest floor, and long body. He has a tall, upstanding carriage and is very muscular. 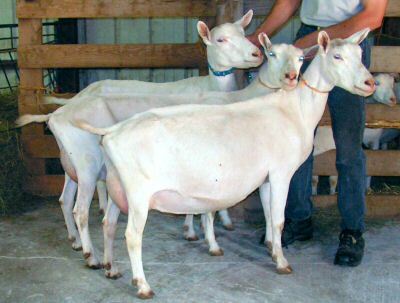 At the 2001 Wisconsin State Fair his kids earned the following awards: 1st pl junior kid out of 17. 1st pl intermediate kid out of 21 and junior champion out of 75 and 2nd pl intermediate kid. His 1st milking daughters, Javic Angelica and Javic Fantasia, freshened this year with dynamite udders. Javic Angelica is pictured in the inset. 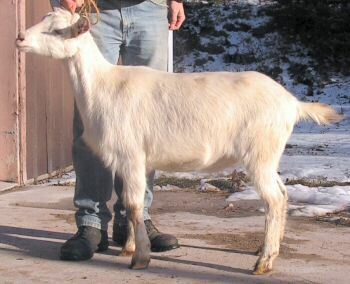 Paragonia is a 'stylish' doeling out of Stylish Paramour. 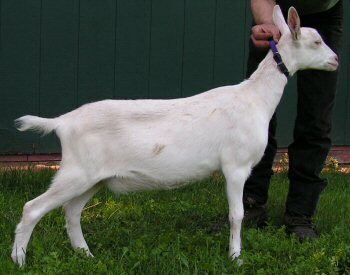 She has excellent feet and legs with a long level topline and she is blended very smoothly in the shoulder area. 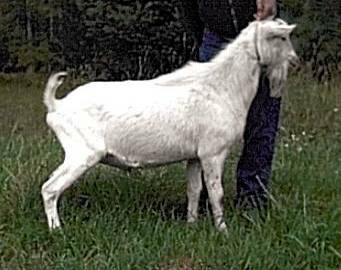 She earned her dry leg her only show out as an intermediate kid in 2003. NSBA All-Time High Scoring Total Doe! 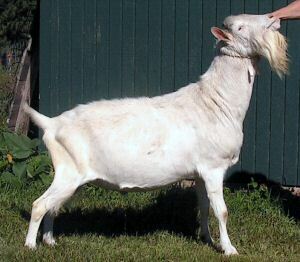 Vanila is linebred on NES Paramount and Angelica. 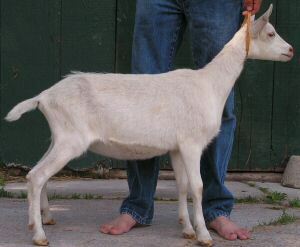 She is a tall yearling with pretty face and nice feet. She is off our 'V' does which are on the smaller side, so we think we have the height we want through Whispers. 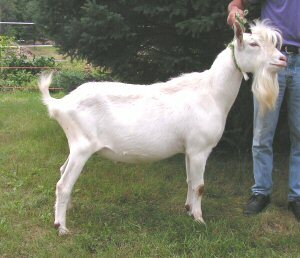 Hopper received rave reviews from all who past her pen at 2004 nationals. Then she surprised with being 3rd pl junior kid as one of the youngest in the class. She has an escutcheon to die for. And that walk - check out the tape! Eclipse is the second Sable we have gotten after crossing Millie with Whispers. Millie and Jam started us in sables, and then when eclipse was born, we were hooked! She is gorgeous. 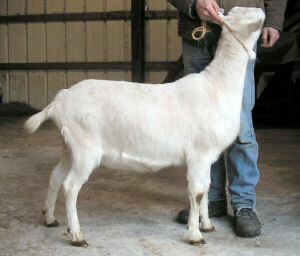 We look forward to presenting her this show season as a yearling milker. 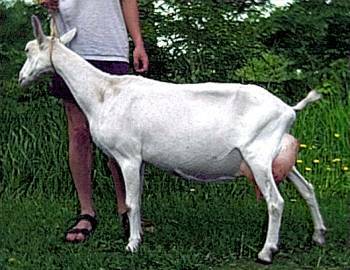 Looking forward to her giving us some purebred sable daughters. 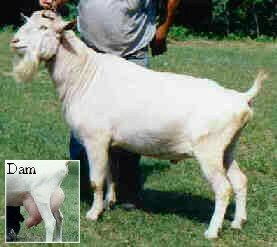 Sceptrum's dam is maternal sister to the 2000 Spotlight sale doe and his sire is the sire of the 2000 Spotlight sale doe, Romantic Starlet. 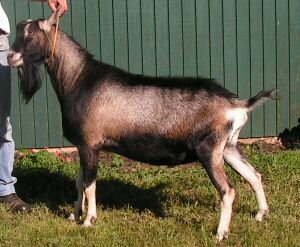 Barbette is bred to *B Lake-Country HYCC Stradivarius. 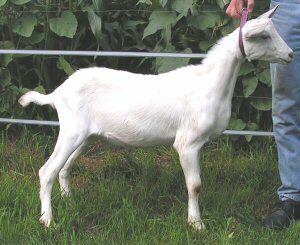 Barbette is the first outcross we have used in a number of years, however she does share some common ancestors with most of our animals. Barbette gave us two beautiful doelings this year. They are very long and level and look just like her. We are so excited. Watch for Malibu and Zubinel in the ring next year. Pinky lost her udder to a spider bite, so we kept her daughter, Little Pinky (Premise). 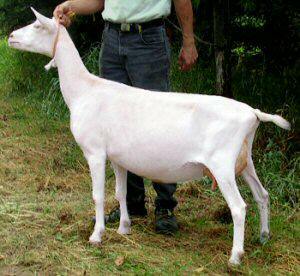 Petrina was a surprise, since Leenie is usually generous with bucklings. 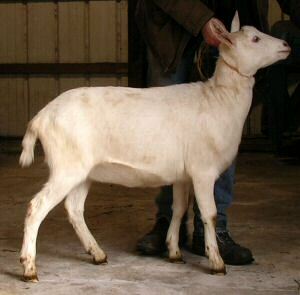 She is an awesome doeling and excells in general appearance. 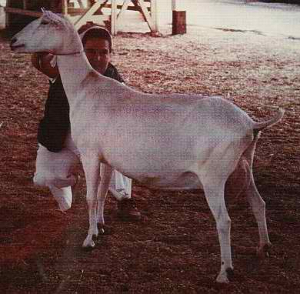 Venissa is linebred on *B HyCrest Countess Constantine FS 92 a son of ++*B Lake-Country HS Avalanche who goes back to GCH Lake-Country Caesar's Sasha, 1993 National Reserve Grand Champion, 1992 Best Udder and 1993 Reserve Best Udder. 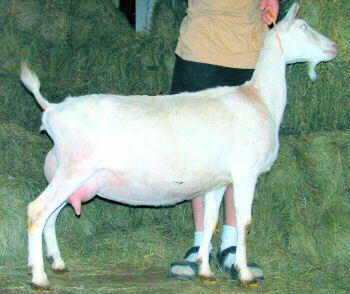 Venissa's dam was fourth place four year old at the 2004 ADGA national show and dam of the 2004 spotlight sale doe, Tara. 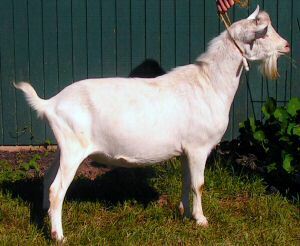 Periwinkle is a stylish PoppySeed daughter sired Stradivarius. 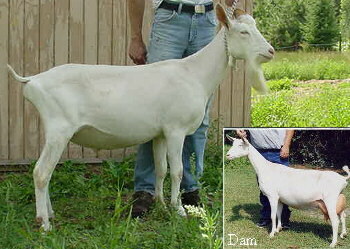 She is similar to her dam in style, but with more length of body. She has been bred A.I. 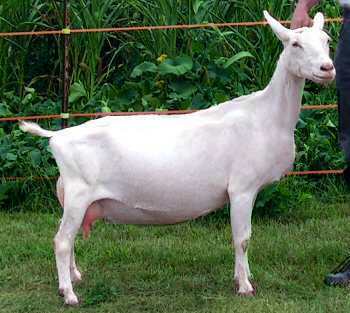 to Perfection Mars to bring back some of the old Saanen genetics that most of our does go back to. We are hoping for lots of size and height from this breeding. Watch out for the little Martians! Angelina is one of two daughters of Aniel's that we kept this year. 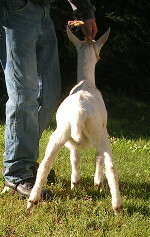 We sold the other equally flashy doeling, though wish we would have kept her. Angelina was 2nd place intermediate kid at the 2006 WI. State Fair. These two sisters were among our latest Spring kid crop being born in May. They are very sleek, refined, tall, and long bodied. They have that 'dainty' look about them which is unusual for our does. 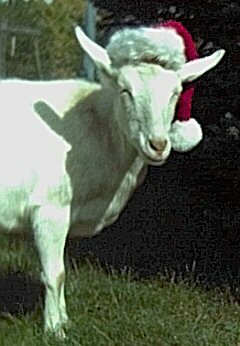 The picture doesn't due Image justice, but she is one of the nicer kids in the barn this year. 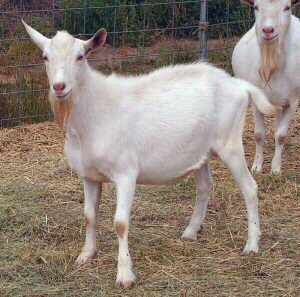 We are very happy with our first kids out of Ghost. Thanks Pat! 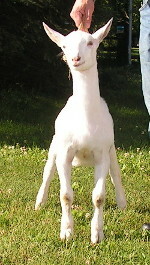 Leroy is as graceful as his Sire, Javi, with nicer legs and feet with strong pasterns and tight toes. 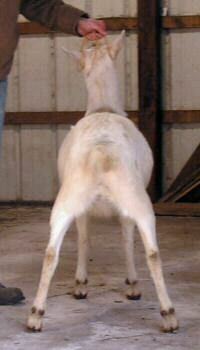 Javi is an impressive buck. He has a very wide chest floor, and long body. He has a tall, upstanding carriage. His daughter, Javic Angelica, is pictured in the inset. 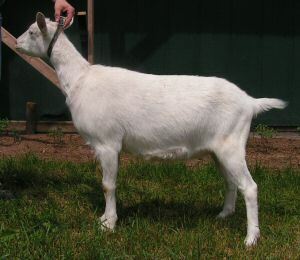 She was junior grand champion at the 2001 WI state fair as well as NSBA All-American. Javi also had 2nd junior get of sire that year. 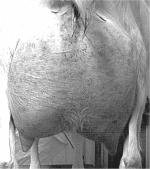 Some of our nicest udders have been on Javi daughters. Most of them have yet to be shown, as they are generally late bloomers, but when they do bloom, they are knockout. Watch for some of them next year in the ring. They also put their hearts in the bucket. One daughter, Javic Parodie (see doe page) has milked over 4000 lbs as a three year old. Loomi is Mr. 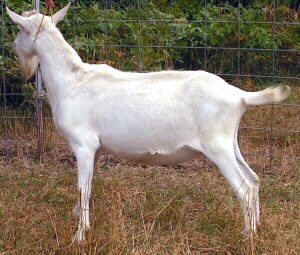 Pretty Boy with his long hair and britches. We love looking at him. 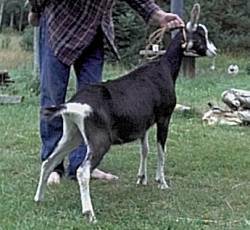 He will be bred to our only sable doeling this year.